Even though many nurses may never navigate organ donation personally or professionally, nurses must learn to care for clients after organ transplantation, and have a solid background in the current approach to organ donation and procurement–the process of harvesting tissue or organs for transplant. The use of grafts in medicine will only become more frequent as technology and medical expertise evolve. I am going to cover some broad concepts about where we are currently with regard to “what’s possible” and what the law allows, and then get specific on points all nurses want to know in everyday clinical practice. Like blood donation, organ donation is life-saving. Mortality for a client with diabetes and ESRD is 10% annually. Over the long history of health policy around transplants, many ethical debates have led to what is a very effective system governing transplant recipients and donors. The word donation on its own implies no compensation by definition. Therefore, paid donation is an oxymoron, is considered unethical, and has been deemed illegal since the National Organ Transplant Act in 1984 (NOTA) –and for good reason! This law is important to know because it also established a national system for organ matching that operates today. Even better, thanks to this system, transplant data has been collected since 1988. Paid organs, or organ vending in popular culture, introduces a host of competing interests that place clients at risk for harm and do not allow oversight to ensure safe and quality organ transplantation. The existing black market organ trade, or “transplant tourism” poses a risk to clients and families desperate for a cure. Nurses teach that seeking paid organs across the globe is risky as part of our commitment to non-malfeasance (do no harm). The other part of organ donation involves autonomy, which is satisfied by requiring consent from the donor. Current law is very clear and states that consent is recorded within each state by a statewide registry of donors (the little heart symbol on your driver license). Otherwise, next of kin may consent to donation for deceased donors. Recent laws around 2007 intersect with ethical debates around physician-assisted suicide and the removal of life support. This area of transplant policy gets pretty complicated. There are two kinds of procurement: tissue and organ. Each are managed separately. Both must be timely. Tissue donation involves an individual that has been declared dead–no heartbeat. An Organ Procurement Organization (OPO) is responsible for tissue or organ procurement, but their teams do so much more. These 58 U.S. entities are governed by federal law, regulated by HRSA (Health Resources and Services Administration), and ensure quality and safety with respect to all tissue and organ donations in the U.S. Teams which include health care professionals with expertise in organ donation are sent immediately after donor death to recover tissue from potential candidates for donation. Workers are trained to talk with the family of the deceased. OPO’s also encourage donor registration to increase the supply of organs and tissue available and coordinate donation. So what does deceased tissue donation look like in the unit? Before an OPO is involved with any case, there must be a declaration of death. The part about contacting the medical examiner(ME) differs according to the situation and state, so be sure to check local requirements. In many places, certain circumstances dictate that the ME must be called (homicide, accidental death, under age 18). This all stems from a 1978 law called the Uniform Determination of Death Act of 1978. In short, it basically says that it is legal to procure an organ from an individual with brain death, but whose heart is still beating. This law has increased options for those awaiting organs–especially organs like hearts and lungs. In the case of chronic disease, the OPO may accept certain tissue donation (cornea), but decline other tissue. Once tissue is procured and preserved, these teams enter information about donors into a database that finds matches for those awaiting donation. Each day, 80 Americans get an organ transplant. Organ donation can occur from living or deceased donors. Whereas tissue donation can be coordinated on the spot, this process requires bit more planning and screening of the donor– and the recipient. Deceased organ donors can donate kidneys, liver, lungs, heart, pancreas, or intestines. Hands and faces have been added to the list more recently. The same criteria apply to organ donation as for tissue donation with some tweaking. There are two types of deceased donation. Non-heart-beating organ donation (NHBOD), that is, organ donation after cardiac pumping has ceased, can be accomplished in some cases. Death involves cell death and is irreversible, but may occur while the heart function is supported. Thank you medical science! This evolving landscape has cleared the way for more opportunities for donation from persons who have brain death but receive life-support. So, brain death, despite maintaining ventilation and circulation on ventilators and/or bypass, is the second option. These patients may require steps to preserve organs such as ‘pressors’ to maintain urine output or adequate BP (tissue perfusion) while awaiting retrieval. Donation must be considered for any patient with confirmed brain death. 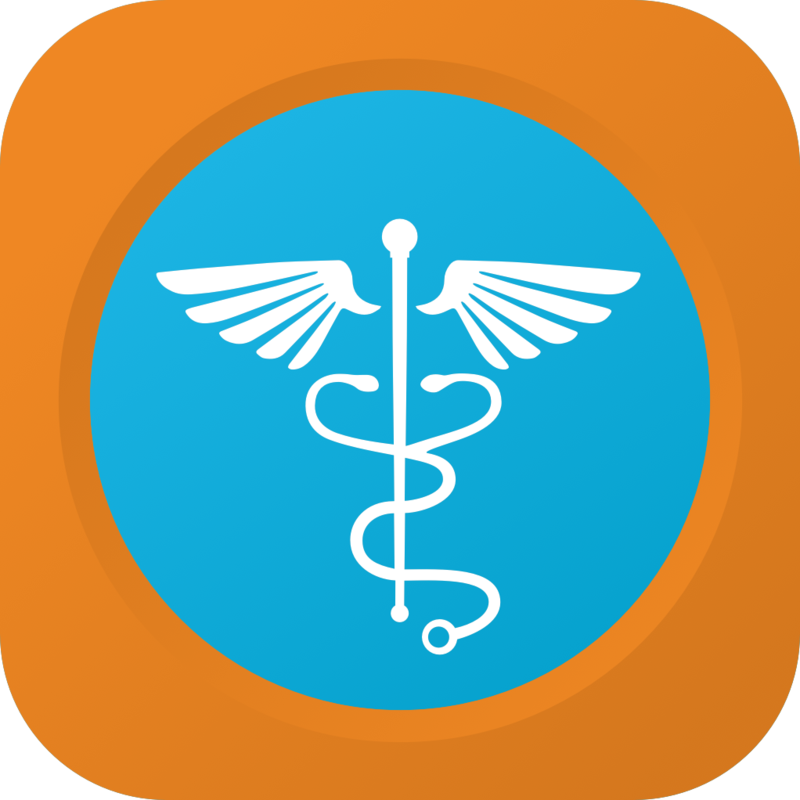 Nurses should document time of death, notification of medical examiner, and whether OPO has been contacted. A client with prolonged asystole is a potential tissue donor, but not organ donor, because organs require an intact circulatory system. The OPO ultimately decides what the donor is eligible for. Medicare requires that OPOs are contacted, and that OPO staff approach families about donation. Telephone consent by next of kin generally requires two witnesses. Never approach a family before family have been informed the client died. Families may decline donation, but all must be given the option to donate. Always contact the OPO before approaching the family about donation–in most cases the OPO representative will talk with the family. The client may not be a candidate. Inform the family that once consent is granted, procurement will occur promptly (within hours). Changes in appearance of the donor’s body may occur with regard to scars, however open-casket is not prevented by procurement. The family should never receive a hospital bill until donation-related costs are resolved. Deceased organ donation most often occurs when a donor is declared brain dead and is receiving life support. Living donations comprise about 18% of all donations currently (UNOS). These occur in one of two ways. Directed donation involves a recipient who is named (picked out ahead of time). Depending on the transplant program, this does not have to be someone the client knows personally. Transplant programs have differing policies regarding donation types and whether non-directed donor and recipient can meet face to face. A non-directed donation (or match) is coordinated based on compatibility. A match is found in the tracking system, and arrangements are made rapidly for transplant. Logistically-speaking, there is a LOT that has to come together for successful organ donation. A transplant surgeon decides if the matched organ can be transplanted depending on the travel distance and health of the recipient. Heart and lung transplants need to occur almost immediately. 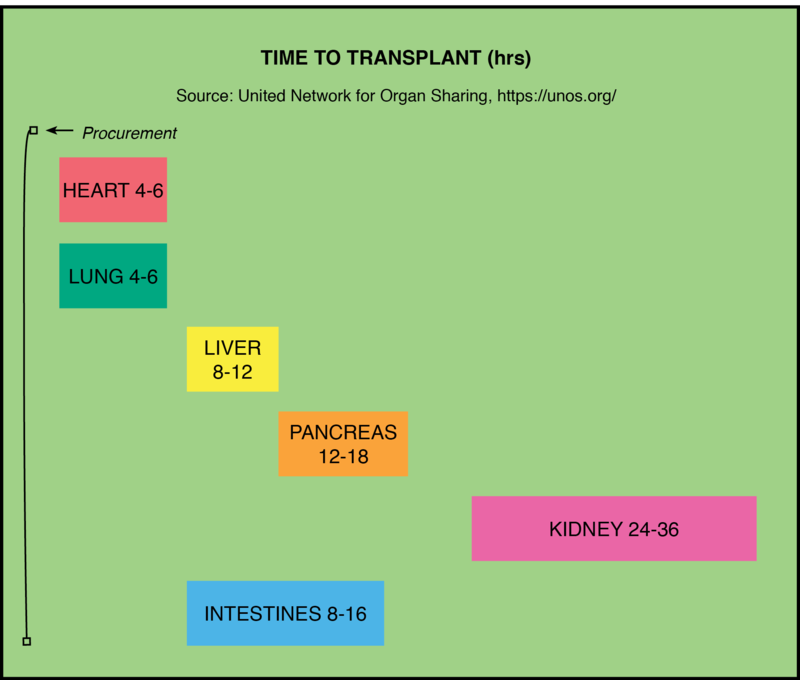 Timing of organ transplant differs greatly depending on the organ. Perhaps the most important factor is blood type and crossmatch for the donor and recipient antibodies. Crossmatch is when blood of recipient is mixed with another blood to detect antibodies that would recognize the donor as foreign. Patients who are a perfect match go to the top of the list. Donation can occur between incompatible blood types or HLA incompatibility. In these cases, the client’s spleen is removed at the time of surgery and medical therapies to decrease antibodies to the donor’s tissue are provided to prevent rejection. To get entered into the database for an organ, clients must be selected by a transplant specialist as a candidate for successful transplant and begin the complex pre-transplant process. This includes measures that enhance health for the client as much as possible before transplant. It may be hard to believe that recipient candidates are selected carefully, but because organs are in short supply, and organ rejection is a major risk, the transplant specialist strives to select recipients with the best chance of success. This will include determining if the recipient can manage the rigorous medication and follow up schedule. A big part of advances for organ transplants success are the availability of immunosuppressant therapy, but this requires a complex care plan before and after transplant. Once patients are on a transplant list, they are given a pager to await notification of a match. Notification may come in the middle of the night! According to the United Network for Organ Sharing (UNOS), over 100,000 individuals await a lifesaving transplant. Still, only a little less than 35,000 transplants were performed last year. Although this is a huge increase since a decade ago, there are not enough organs for those who need them. Transplant physicians make this decision and consider the health of the recipient when making decisions about matching a donor. Graft success can also depend on the health of the donor and the amount of time the graft is in cold preservation (“on ice”). Kidney transplants are the most common organs transplanted in the U.S., comprising 16,000 transplants per year. This may be due to the length of time kidneys can be preserved outside the body, as well as the availability and role of kidneys (we all have 2 and don’t need both!). Livers can be donated by living donors, too, but since kidneys are encountered most often, let’s summarize some important points..
Kidney donation is categorized by factors that predict graft function after transplant including standard criteria donor (SCD), donation after cardiac death(DCD), or extended criteria donor (ECD). ECD donors may have chronic health issues despite adequate kidney function. 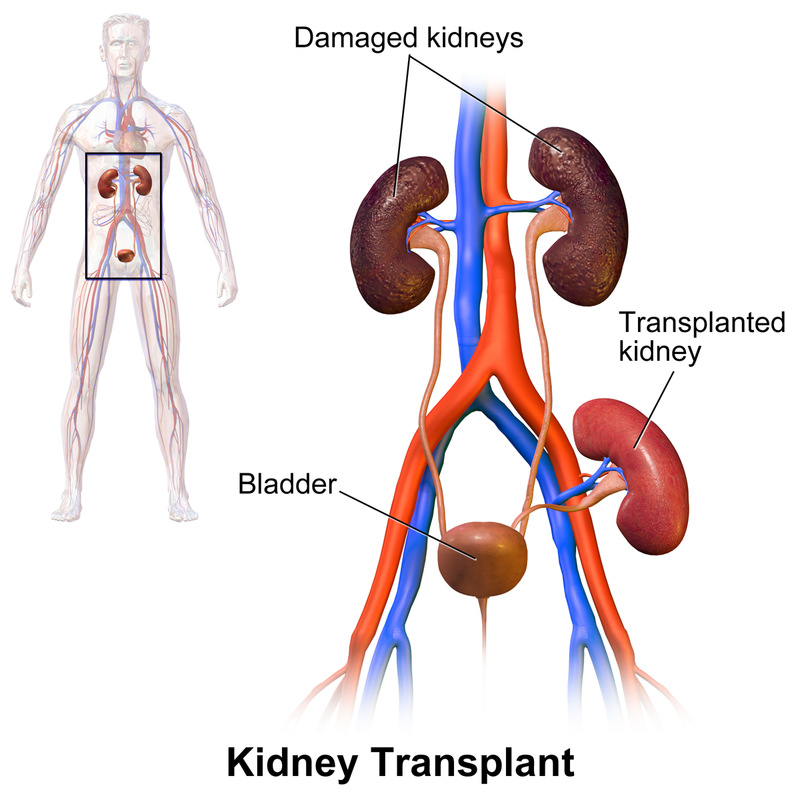 The transplant team does not remove the old non-functioning kidney in most cases. The “graft organ” (new kidney) is attached to the blood supply and the old kidney simply atrophies and is reabsorbed. When I was told this at a transplant training I attended at Dartmouth-Hitchcock I was stunned, but the body is an amazing thing. Early recognition of infection (fever) post-op is essential because clients are immunosuppressed! Montgomery, R. Et al. (2011). Desensitization in HLA-incompatible kidney recipients and survival.New England Journal of Medicine. 365: 318-326.